I'm going to stick my neck out and predict that we are witnessing the beginning of the final fizzling-out of religion in the USA. It's true, religion is far more "in your face" there than in other Western countries. But I sense it is a flimsy facade, and like religion in Australia in the 70s before it basically disappeared from view. Most people are half-heartedly going alonw with the crowd, to avoid the kind of hassle described above. 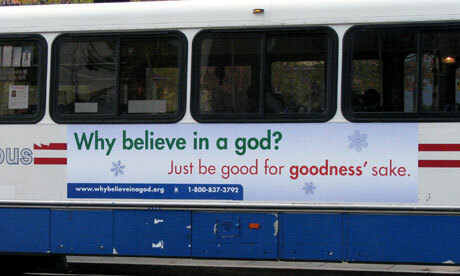 A few public announcements by sensible middle-class atheists who don't appear to be trying to smash the state - like these bus ads - and critical mass could easily tip toward atheism or agnosticism a la the rest of the West. Something rather like this happened politically in the US this year. Have you read Joe Bageant's "Deer Hunting With Jesus"? It's an excellent look inside the highly religious, socially conservative culture of the "red states", by a son of that culture who moved to California in his teens and back some four decades later. The point being, religion there isn't a facade put on by otherwise modern secular people, but a deeply ingrained part of the culture which isn't going to fade into the background overnight. "By the beginning of December we'd received 37,742 hits on our campaign website"
in today's Age . VICTORIAN state primary school students will soon have an alternative — religious education lessons taught by people who do not believe in God and say there is "no evidence of any supernatural power". The Humanist Society of Victoria has developed a curriculum, which the State Government accreditation body says it intends to approve, to deliver 30-minute lessons each week of "humanist applied ethics" to primary pupils. Accredited volunteers will be able to teach their philosophy in the class time designated for religious instruction. As with lessons delivered by faith groups, parents will be able to request that their children do not participate.